I hadn’t been here for 23 years when I returned there last week to visit Oyster’s Marine Conservation project in Thailand. I was relieved that the Thai people seemed every bit as hospitable and the food was as amazing and cheap as ever. Back in 1990 as a Backpacker you felt wonderfully detached from the outside world and collecting letters at the “Poste Restante” at Bangkok post office was the only link to home– international calls were for emergency use only then. Today’s Backpackers are writing up their travels on Facebook the moment they land on the free Wifi you find everywhere. Air con taxis have replaced “took tooks” – the motorised tricycle taxis that sounded like chain saws. The heat (35C in May) and frenetic positive energy is just as I remembered it. Oyster’s Marine project is on Koh Phangan, one of Thailand’s prettiest and least crowded islands. One of the highlights of my trip was getting to Koh Phangan. Within a couple of hours of stepping off a Boeing 747 from the UK I climbed aboard the low flying Propeller plane from Bangkok to Koh Samui enjoying great views of Thailand’s coast and the islands. 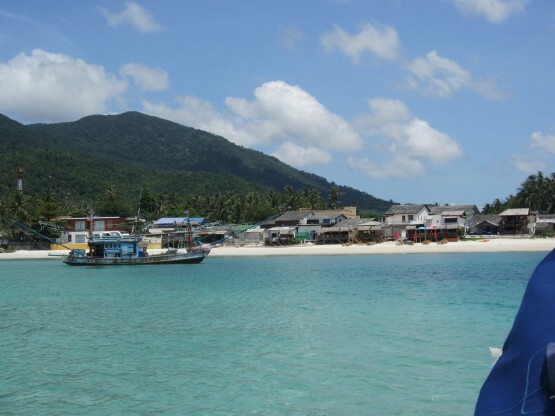 I spent the night on Koh Samui adjusting to a humid 35C before getting an early morning hydrofoil to Koh Phangan – a 30 minute ride through the warm air, enjoying the sight of the green forested mountains of Koh Phangan growing ever taller. The project is based in a small relaxed village on the edge of a beautiful bay with white sand and surrounded by palm trees and mountainous forest– I expected to see James Bond with a Vodka Martini in hand at any moment. The Marine project exists to protect the coral, one of the essential features of sustaining fish life and is well regarded by locals as well as the Thai government. Without the small fish that live off the coral, there would be a decline in big fish, something that would affect us land orientated humans as would the loss of one of the most beautiful parts of our planet. The passion of the team for conservation instantly rubs off on visitors – even on non Biologists like me. 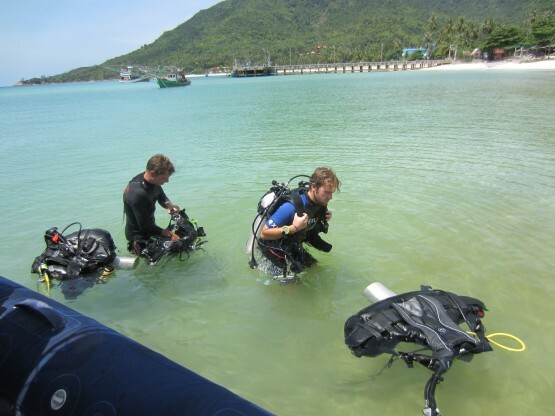 The operation is very professionally led by its founder, Eike, a Marine Biologist supported by Stefan who is responsible for all aspects of the diving. Having last dived on my 1990 trip, I felt very reassured by Stefan who stayed within an arms length throughout the 75 minute dive. You have to dive to understand the thrill of being visitor in an underwater world. Around the coral is a constant flow of colourful fish, including some quite large ones too. The coral itself is an eye catching maze of different colours and shapes. The main work of the volunteer is to measure the growth of the coral in the underwater nurseries and to take water samples to test the purity of the water. This involves plenty of diving and some more mundane data input work back at base too. Volunteers need to be committed to the project and in return will learn so much, enjoy diving, great camaraderie and the relaxed pace of island life. Although there is plenty of amazing diving and good social interaction, this is probably not the project to do if you want more of a party scene and several dives a day. We dived in deeper water than this!